Bella (Bringing Every Living Life into Activities) Rehabilitation Centre is a combined day school and orphanage based off the Ngong road in Nairobi. It was set up in 2008 by a retired school principal, Mrs Azenga, following the post-election violence. Bella is now a registered NGO and primary school and has 140 pupils ranging in age from 3 to 14. There are 20 children which sleep at the school in 2 different dormitories as they have no other family members to take care of them, however the other 120 pupils would be considered ‘vulnerable’ as their families come from very limited means and live in the local Kibera slum.The centre has 9 classrooms, as well as a kitchen, store room, toilet, office and library. The class rooms are made from corrugated iron and wood, they each have a black board in them and some joined desks. The Sure24 orphanage in Nakuru, Kenya provides a home to more than 120boys and girls aged between 2- 19. The organisation also runs a school for 280 children, mainly street children, and provides a weekly feeding programme for over 250 local children as well as providing general support to the local community. In February 2014 the majority of shoes collected at Meadow Sure Start Children’s Centre and Fairfield Halls during December 2013 were distributed at the orphanage. Donations of football boots from the collections held at The Hayes, Keston Primary, Direct Line Group, Little Kickers East Surrey and Hillside Kindergarten, alongside a private donation from Kate means the football team at the orphanage now all have football boots to play in. In July 2016, Sure24 took delivery of their third Sal's Shoes consignment. 3,555 children received a pair of Sal's Shoes. The Eusebia Hope Foundation serves 53 children either orphaned by AIDS or neglected and/or abused in their birth homes in the village of Igoji, in the district of Meru in Kenya. Their tin shack premises [pictured] serves as a pre-school (for 13 children aged between 1-4) and a Class 1 classroom (for 30 children aged between 5-7) in the day, and a dormitory at night for 25 of the children. The remaining children stay with extended family in the village at night (mostly elderly grandparents who can't tend to their needs in the day). In September 2016, Sal's Shoes found their new feet amongst all the children under the care of the Eusebia Hope Foundation. All the school age children received a pair of school shoes and play shoes and all the pre-schoolers received their first pair of shoes. The first time someone sent us their pre-danced in ballet shoes we weren't quite sure where we'd find them new dancing feet so we set them aside. We continued to do this with all the other ballet, jazz and tap shoes that came our way, until earlier this year when all the ballet and jazz shoes we'd collected set off with http://missiondirect.org to Kenya to find their new feet at the dance classes run by http://www.annosafrica.org.uk at the 3 schools where they run an arts programme in Kibera, Mathare and in Nakuru - Sal's Shoes are dancing again. 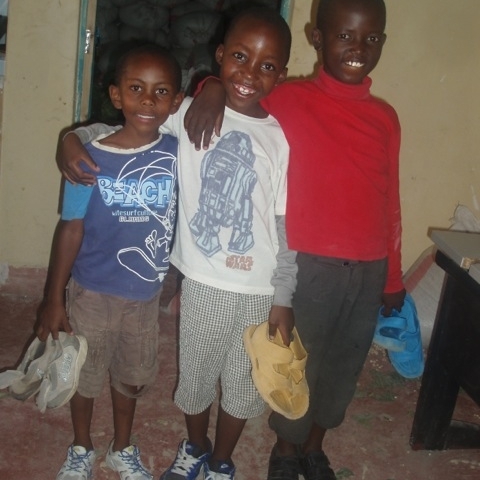 Sal's Shoes went back to school at Sure24 in Nakuru, Kenya http://phoenixcommunity.org/charity/sure-24-in-nakuru-kenya/ in January 2017. If all students in low income countries left school with basic reading skills it’s estimated 171 million people could be lifted out of poverty (UNESCO 2010). In reality, many rural secondary schools in East Africa don't have the resources to enable teachers to teach effectively, and struggle to provide an environment that enables students to acquire knowledge and skills, enjoy learning and to feel empowered. http://epafrica.org.uk supports such schools to provide their students with the education to realise their vast potential. Earlier this summer the boys at the school played in a football match against a polytechnic college (aged 18+) who were fully kitted. The St Luke’s boys were playing barefoot, as none could afford boots. As a result, many were injured by the rough ground and the opposition. Some suffered repeated injuries that left them unable to run, and one boy dislocated his ankle during the match.